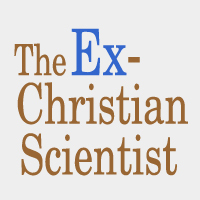 The stories posted on The Ex-Christian Scientist tell of very personal and sometimes rather painful experiences with Christian Science. We encourage comments that are supportive and sensitive toward our contributors. As with any website containing dialogue, there are some instances where comments will be edited or deleted. Comments including profanity will not be deleted, unless that profanity serves no purpose other than to insult someone else. Comments which include spam or contain excessive profanity, personal attacks on any person, or which name individuals or advocate violence will not be posted. Ableist, gendered, homophobic, racial, and transphobic slurs will be deleted. Irrelevant ad hominems will be deleted. That is not Christian Science. No Christian Scientist would do that. 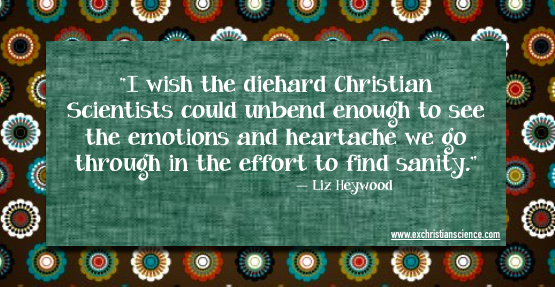 You didn’t give Christian Scientist a chance, really understand it, or make it your own. You didn’t practice Christian Scientist properly. These stories are exceptions, my experience in Christian Science is different! People die in hospitals too! As of 2019 comments on posts will automatically close after 30 days. The community coordinators reserve the right to edit or delete any comments submitted to this blog without notice. All comments are moderated. This comment policy is subject to change at anytime.